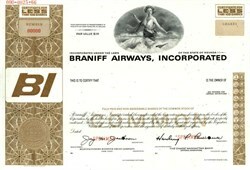 Beautifully engraved specimen stock certificate from Braniff Airways, Incorporated printed in 1968. 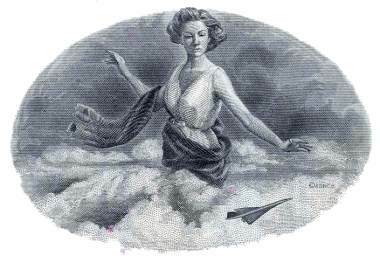 This historic document was printed by the American Banknote Company and has an ornate border around it with a vignette of an allegorical woman and a Concorde SST. This item has the printed signatures of the Company’s Chairman (Harding Lawrence) and Secretary, and is over 48 years old. Braniff Airways, Inc. d/b/a Braniff International Airways was an American airline that operated from 1928 until 1982. Its routes were primarily in the midwestern and southwestern United States, Mexico, Central America, and South America. In the late 1970s it expanded to Asia and Europe. The airline ceased operations in May 1982 because high fuel prices and the Airline Deregulation Act of December 1978 rendered it noncompetitive.